Most of the sessions I attended were focused on resources for instructors and creating engaging learning environments for students. As a new teacher, it was interesting for me to see how instructors in different universities use the Brightspace LMS. The sessions on blended and competency-based learning were very informational. Some of it I already knew, and some of it was new to me. I enjoyed the hands-on sessions the most because I had a chance to see what instructors could do and/or add to their courses utilizing Brightspace tools. I stopped at the Office 365 booth as I was curious about it because Regis has recently introduced it to the Regis community. At that time they demonstrated and introduced Office Mix (A free add-on for PowerPoint, for more information see: https://mix.office.com/en-us/Education). In order to be able to download and use Office Mix, you need to have PowerPoint 2013. I am planning on learning more about Office Mix and how it works. I enjoyed the conference, and I am grateful that I had this opportunity. Thank you. Earlier this month, I attended the 12th Annual Online Learning Consortium’s Blended Learning: Leading Education’s Digital Future conference here in Denver. Generally, blended learning refers to using both online and face-to-face learning experiences to teach students. A common example of blended learning is students in a course traveling to campus to meet face-to-face one only once per week, instead of twice, and the coursework they would have otherwise completed in that second meeting takes place online. I have also heard other terms such as “hybrid” used to describe this type of approach, and through reading online resources and having conversations I have found that exactly how “blended” or “hybrid” courses are delivered can vary widely. This was my first conference dedicated to blended learning topics, so I wasn’t sure what to expect. What I found was, while there certainly were many sessions that addressed issues specific to creating blended courses, much of the information shared could also apply to the process of creating sound and engaging courses regardless of the delivery method. I attended several different sessions and made my choices based on how the topic might apply to my job as an Instructional Designer (ID). I’m always looking for new tools and ideas that I can use in my work developing courses with faculty. As a result, I ended up attending several sessions that were presented by IDs. While I took lots of notes and saw several great presentations, there were four takeaways that lodged themselves in the crevices of my brain and stayed with me to ponder after the final session ended. I attended a session titled Walk in an Instructional Designer’s Shoes: Designing Hybrid Courses which was presented by an ID named Bill Egan from Penn State. Bill shared in detail the process that Penn State uses to support faculty in creating blended courses, highlighting the concept of “before, during, and after”. Blended development is approached from the perspective of how students will be using technology to learn before, during and after face-to-face class time. Bill’s presentation, which addresses this approach, is available on the OLC Conference website. I also found an online resource title What is Blended Learning? which outlines the process. Definitely worth a look. I saw some very interesting sessions that shared online courses that were created to provide faculty with resources for developing and teaching online courses. One such example was provided by CU Online. In Reinventing Faculty Professional Development the UCD team provided a look at their Online Skills Mastery (OSM) Program--a 10-week online facilitated course designed to “prepare University of Colorado - Denver faculty for teaching with digital tools, with a focus on great digital pedagogy.” (CU Online OSM website). You can take a peek at a sample of the OSM course and explore the growing list of electives they plan to offer as a part of this program at the CU Online OSM website. Both CU Denver and Concordia reported a great deal of success with their respective approaches. These presentations gave us plenty of food for thought about how we could borrow some of these ideas to support faculty at Regis. The proliferation of mobile devices and the ability for anyone to easily capture and share video in just a few simple steps is definitely having an impact on how video is being used in both classroom and online courses. Concordia reported that every online course they develop includes an introduction video and, as a standard practice, instructors record and upload a brand new video to introduce each week as they are teaching a course to foster a greater sense of connection and increase student engagement. Another session I attended titled Moving Student Presentations Online addressed using video in online or classroom-based courses for presentations. This session showcased how the faculty at Grand Valley State University in Michigan are seeing positive results using Ensemble Video in their LMS for student group work and peer review. Additionally, Ensemble’s annotation feature allows instructors to stop and start a student’s video presentation submission and provide feedback at specific time signatures throughout the presentation. They posted their slides for this presentation online, a resource definitely worth checking out if you are interested in learning more about this valuable tool. The last major takeaway I gained from the OLC Conference was the perspective that I heard time and time again in several sessions—whatever course development approach an institution uses, it is essential to have good communication between all parties involved to facilitate the collaborative effort. Bill Egan from Penn State shared the process that his department uses in his slide presentation, which typically consists of a guided development process that supports the faculty in course development at each stage. A detailed look at the Penn state process can also be found on the PSU Learning Design website. In the session Intentional Blended Design: Creating an Evaluative Course Map, Jason Drysdale of UC-Denver also emphasized the importance of collaboration by sharing his process of working with faculty to map an existing course. The process he described covered how an instructional designer and course author can to use mind mapping tools to work together and examine a course’s outcomes and assignments to target where changes need to be made. Last, the team at Concordia shared their “rigorous process/project management system for designing high quality, digitally rich course learning environments through collaborative partnerships with faculty” (OLCConference Presentation page). Their presentation walked the attendees through their muliti-step process (see slide 14 for an overview) which provides guidance and support for faculty every step of the way. This session was a collaborative effort between the Gates Foundation and various institutions including Arizona State University. The Gates Foundation funded an initiative and research conducted by ASU regarding adaptive learning environments. Research focused on traditional undergraduate students taking no higher than 200 level courses. They developed multiple courses in an adaptive format. Developing a brand new course was time intensive and took about a year to create. They also adapted existing courses within a shorter timeframe. Students were grouped in a flipped environment where they were exposed to lower levels of Bloom’s Taxonomy before coming to class. This included reading assignments and watching videos. The learning management system was used as the course infrastructure and plugins within that system were used to make the learning more adaptive. An example was given by Rio Salado University who integrated an adaptive formative assessment tool. This tool was used to help students build towards higher levels of thinking under Bloom’s Taxonomy. This discussion provided insight into how Concordia University is developing quality courses at their institution. The main goal of their process is preserving course quality and preserving the institution brand by ensuring quality standards are being met. To assist them in meeting this goal they have the support and backing from the deans of each respective school. The deans work with the program director to ensure the right faculty are put into place when developing an online course. Some criteria of a good course developer include someone who can develop original content, someone with good writing skills and someone who is comfortable with technology. Faculty are given timelines, due dates, and must sign a contract before beginning the course development process. The process includes a kickoff meeting, the designing of the syllabus, drafting the modules, and the design of the final course shell. They typically develop four to five courses within a four month time frame. To support faculty efforts, Concordia University has a training department that specifically support faculty needs. Trainings include pedagogy in practice, the use of the learning management system, and technology tools for teaching. The final product of this process is a master course. This course is taught once by the faculty developer to determine what adjustments need to be made. From there the schools work with individual faculty teaching sections of the course to see what can and will be adapted for each section. Consistent user experience and consistent content structure is a key piece to the course development process. Institution analytics was a common theme of this conference and this session provided great examples of how schools are using this information to better serve learner needs. Lee College, for example, used analytics to define their students. This in turn helped them to develop their programs to better serve their student population. With a more non-traditional base of students Lee College created a weekend college. Utilizing a cohort model, each fall 100 students would begin an accelerated program of eight week courses. Programs included computer technology, welding, and business. The timeframe for completion was two years and the institution utilized student success coaches to assist students along the way. These coaches used analytics to track their students and intervene before students got into academic trouble. This tool was also used to define risk factors up front for each student in an effort to circumvent any issues down the road. This tool has helped with student success and retention. Yet another excellent OLC Blended conference was held this past week at the Denver Sheraton Downtown conference center. This year saw a significant focus on methods for encouraging adoption of blended methods by faculty. Presenters from University of Central Florida showcased their Blended Learning Toolkit, a group of tools and resources for designing blended course materials. The BlendKit was developed in association with the American Association of State Colleges and Universities (AASCU). Using the BlendKit materials, instructional designers from UCF offer a 5-week MOOC for guiding faculty in the development of a blended course. Materials are also available for self-paced study. And all BlendKit resources can be freely used and shared through a Creative Commons license. Kudos to UCF for sharing their exceptionally well thought out processes for getting faculty on board the blended band wagon. The BlendKit partnered with EDUCAUSE so that participants could pay a small fee and submit their portfolios to EDUCASE to earn a master badge. In the session titled Reinventing Faculty Professional Development, presenters from CU-Online explained their approach to faculty development. 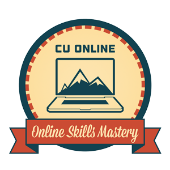 Using internal funding, CU-Online staffers created the Online Skills Mastery (OSM) program, a 10 week, fully online, facilitated workshop for teaching with digital tools. The entire workshop is facilitated by faculty, with UC-Online instructional design staff providing grading and technical support. Faculty participants are enrolled as students. A small monetary stipend is offered to all faculty successfully completing all requirements of the workshop including readings, discussion postings, assignments and other assessments. A badging program is in pilot stage and uses the Canvas BadgeSafe platform. A third approach for preparing faculty to use blended methods was presented by colleagues from Florida Atlantic University. Their approach focuses on a one-size-fits-all method. Funded through a DL student fee, their approach uses a combination of consultations, workshops, open labs, eDesign and eCertifications to prepare faculty for using blended methods. Atlantic U. uses more of a just-in-time approach that doesn’t require an extended time commitment by faculty. For example, their one-hour lunchtime technology workshops are sharply focused. The first 30 minutes are spent on the pedagogy of the technology and the last 30 minutes demonstrating the use of the technology. An important point is that all workshops are facilitated by faculty users. Using faculty facilitators brings that all-important buy-in from faculty colleagues. Staffers may know more about the mechanics but faculty users bring the classroom experience that colleagues can relate to. Technology showcases are always a treat for me, and the conference didn't let me down. The Technology Test Kitchen was an area set up withing the exhibit hall containing a variety of apps and devices for hands-on demos. I finally got my hands on a pair of Google glasses for a quick view. The "chef" explained that first generation devices were in the $1,500 range but Sony is scheduled to release a new-and-improved version for a more reasonable cost. There was also a green screen setup using a tripodded iPad and the Green Screen app. This has great potential for livening up webcasts and lecture captures. Several Google Cardboard devices were available but iPhone apps that take advantage of the virtual environment are still in very short supply. And I finally saw the Swivl device demoed. The Swivl is used to record presenters. A mobile device is placed in the Swivl. After turning on the Swivl app, the presenter places a small tracking device on their person. They can then walk around the classroom and the Swivl device will follow their movement. This would certainly fit the bill of on-the-fly lecture capture and has definite possibilities. It was announced that this was the final OLC Blended conference. OLC is merging their Blended and Emerging Technology conferences into a single event, with the 1st Annual Innovate conference scheduled for April 20-22 in New Orleans.